No loan instruments are provided for the ensemble course. 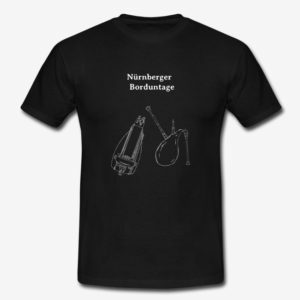 Maximum participants per workshop are 10 (15 for Ensemble workshop).In 2019, we are offering Hurdy-gurdy, Huemmelchen and Ensemble lectures. Please be aware, that during our bagpipe workshops Huemmelchen are used (tuned on C/D). Other kinds of bagpipes like Schaeferpfeife or Great Highland Bagpipes will be presented, but not used during the workshop. In agreement with the instructors, if your experience level is not met, you are welcome to switch workshops. If necessary, you can already put your luggage in the course room from 2 pm. From 2-3 pm you also have the opportunity to check your instruments for minor problems. If you have questions about tuning and maintenance Alex will assist you. Please note that NO REPAIRS can be made within this offer. Keys for your rooms can be collected from 3.30 pm onwards at OUR registration desk (not Youth Hostel desk!) situated in the dining hall right behind the main entrance. All participants gather at 4:30 pm in the dining room of the youth hostel (directly at the entrance) for a welcome. First lectures will be right after the assembly. The end of the workshop weekend will be at lunch on Sunday. After lunch, we will have a voluntary concert with all participants. From last years’ experience until approximately 2.30 pm. On Friday evening, room 3 can be used for a Session at least until 10 pm. After that, we are asked to quiet down a bit to not disturb other guests. Thanks to the thick walls of this castle building and us occupying the whole level, where the room is situated, there is a high chance of an open end session evening. On Saturday evening, we will be at Finya’s tavern, where you are welcome to bring your instruments for a session. The workshop fee does NOT cover food and drinks at the tavern! Additionally to the “normal” workshops for your chosen instrument, we will offer “Mini-workshops”. These will take place 30-45 minutes before, and 30-45 minutes after lunch on Saturday. 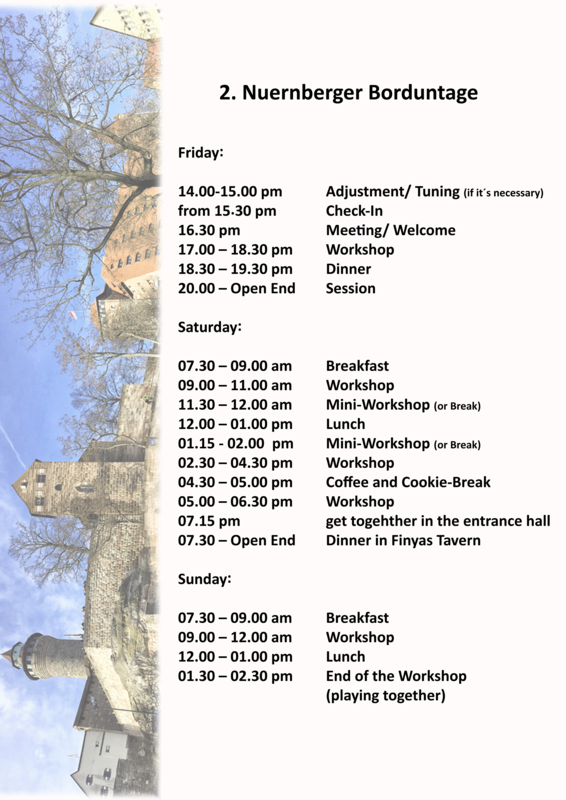 Of course, you are free to use this time to practice individually or visit Nuremberg historical town center. Here you can find the Youth Hostel via Google Maps. Parking in front of the Youth Hostel is only for loading and unloading. Please use Maxtorparkhaus or the adjacent streets (only few parking lots) to park your car. 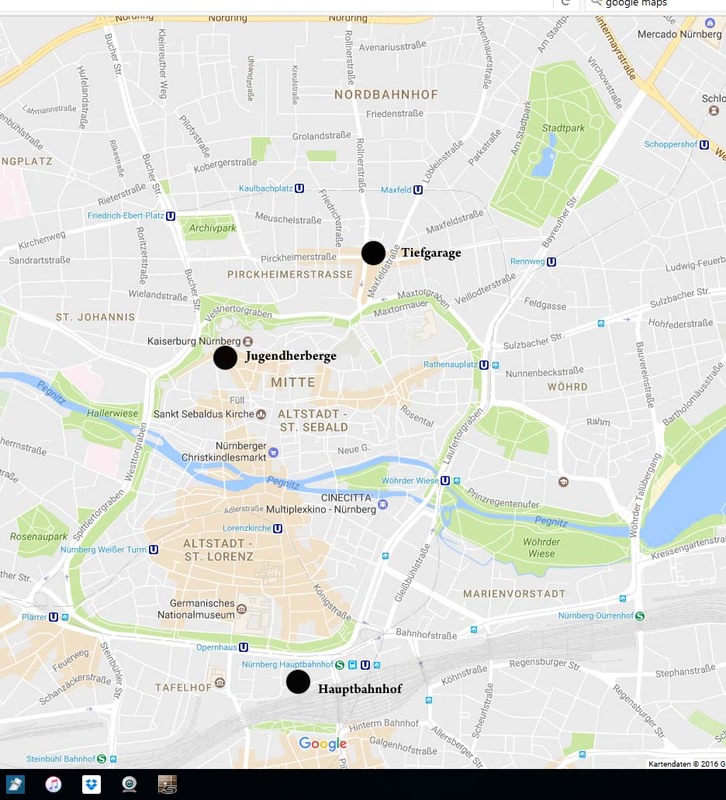 Arriving by train you can use U2 or U3 directly from the main station until Rathenauplatz. From there it is a 5-minute walk. Walking directly from the main station takes about 20 minutes.